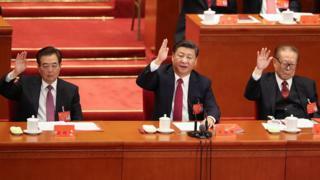 The Chinese Communist party voted this week to enshrine President Xi Jinping's ideology into its constitution, elevating him to the same level as founder Mao Zedong. "Xi Jinping Thought", according to Mr Xi himself, is the belief that it is time for "socialism with Chinese characteristics for a new era". But that sounds similar to Mr Deng's "socialism with Chinese characteristics". So just what are those Chinese characteristics, and while it might be unfair to compare them as they are operating in different times - is what President Xi has achieved so far comparable to Deng Xiaoping's accomplishments for the economy? The annual average income of a Chinese person was less than $100 (£76.21). Today, China's economy is the world's second largest, and by some estimates could overtake the US's by 2029. All of this has happened largely due to a state-driven, managed economic system that Deng helped to put in place. But all of that came at a huge price. Air and water pollution from factories producing goods in China has soared. This has led to health problems for millions of Chinese families. And while hundreds of millions of people have been lifted out of poverty, there's still a huge gap between the rich and the poor, leading to rising resentment against the elites in the Chinese Communist party and their children. Deng's legacy was also tarnished by the Tiananmen Square massacre which reinforced the West's belief that even if China followed Western methods to expand its economy, it would never follow a similar political system. When President Xi Jinping came to power in 2012, the Chinese people had already experienced three decades of double digit growth. But Mr Xi has also inherited a country with massive public and private debts, bloated state-owned companies and higher expectations from a new and confident Chinese population who wanted the Communist party to deliver public goods and improvements in welfare. Rebalancing the economy: Mr Xi wants to move the economy away from manufacturing and exports to focus on consumption and services. This ties in with the stated goal of boosting innovation, and he's had some success with this. By some estimates the share of consumption in China's GDP has been growing. Mr Xi's "One Belt One Road" initiative is also part of the "Great Rebalancing", as it is focused on getting Chinese companies to build infrastructure projects overseas. But it's been criticised for exporting debt overseas. Reduce public and private debt: This in part was what the anti-corruption campaign was about - although it was also about Mr Xi strengthening his grasp on power. Party officials in China's provinces were racking up debt launching expensive and unnecessary investments. Clamping down on their excesses was a way for Mr Xi to weed out provincial debt and kill off these vanity projects. The reform of state-owned enterprises is also a part of this, but that appears to have been put on hold for now. Reduce inequality and improve environmental protection: China's inequality has been rising as the economy has grown. And at the beginning of his term, pollution became a massive social issue that threatened the legitimacy of the Party. While he's talked tough on both of these issues in this year's speech and tried to improve implementation of regulations, at the end of the day it's doubtful how much he has achieved. While it's clear Mr Xi will go down in China's Communist Party constitution as the most elevated leader since Mao Zedong, it's not as clear whether he will be able to match the economic achievements that Deng Xiaoping had. Deng was always going to come out better in this competition, just based on the hard numbers. Starting from scratch is much simpler than trying to refashion the Chinese economy, as Mr Xi is attempting. Mr Xi's economic achievements are important, but will never be revolutionary. There is no way they could be. The biggest revolution is a philosophical one - Mr Xi wants the world to recognise that China is a global force - not just economically, but ideologically as well. He's offering China's way as an alternative model to the West's - a way for other countries to grow their economies but "preserve their independence". So expect Mr Xi's China is to continue on its assertive and confident path. Expect steady but slowing economic growth - but most importantly expect an economy that's still heavily controlled from the top down, not growing from the bottom up.